ang weird ng weather tonight! and we're pretty sure the weather is gonna stay weird, thanks (or no thanks) to global warming. a week and a half ago, when we arrived from europe, people were warning us about how hot it was in manila. well, march was beginning and that means summer. but if you thought it was safe to hold outdoor events, ha!! you're taking a big chance. 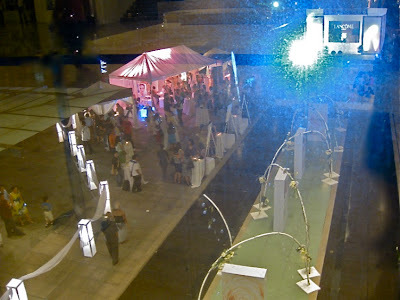 tonight's lancôme event was held at the "fashion walk" area of greenbelt 5—that's where the fountain area is. the sky was orange as the sun was setting and there was a light breeze, so we decided it might be a nice enough time to walk from our office in amorsolo street to greenbelt. kasi feeling namin na sa europe pa rin kami haha! it was pleasant enough in spite of the crazy cars on the road that don't give way to pedestrians (even when you're on the pedestrian lane—even european drivers are learning to give way to pedestrians!). we encountered office girls in chinelas on their way to commuting home, messengers who had parked their motorcycles for the night, and spouses who work in different buildings meeting up halfway. by the time we reached the event, uh-oh, we felt the first droplet. droplet lang kasi drizzle pa lang. it didn't look like the event was going to start any time soon because the mass was still going on in the greenbelt chapel a few feet away. 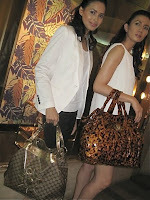 here's a tip: events held at greenbelt's fashion walk cannot begin until the mass is over. tonight we noticed that there wasn't even any music playing while cocktails were being served. walang ka-ambiance-ambiance. tsk-tsk... should you change the time of your event or should greenbelt change the time of the mass? hmmm... we decided to move to the greenbelt 4 event where its stores were presenting their spring/summer collections. bag collections, that is. and the place was hopping! it was packed with guests, a band was playing in the center, drinks were flowing, scattered buffets were busy, and models were posing and primping. can you guess the brands? 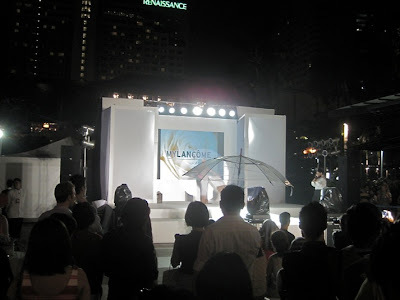 by the time we returned to lancôme, the show had begun but the guests had to sit under the drizzling night sky. and when the show ended it had turned into an honest-to-goodness downpour. naku, sayang naman ang bago naming bag! as we write this at home, it's still raining hard outside. looks like this chance of precipitation is going to continue on... ang weird ng weather!